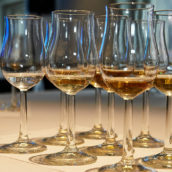 Close on the heels of the Diageo Special Releases (no, we don’t have any Port Ellen left) came the surprise announcement of the winners of this years awards in Jim Murray’s Whisky Bible. The big one that everyone always wants to know about is the top whisky – Jim’s Best Whisky in the World. 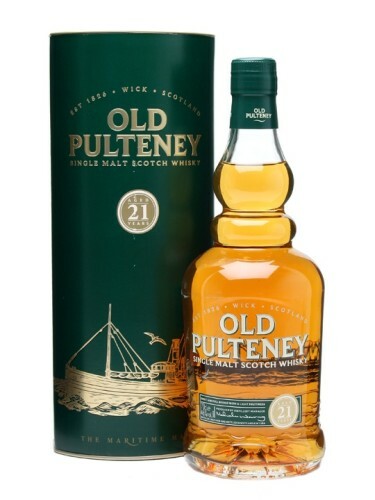 This year’s winner came as a bit of a surprise at first – it wasn’t an Ardbeg it’s Old Pulteney 21 year old. Now, that’s not meant as a slur against our friends up in Wick, far from it. We’ve been fans of theirs for a while, with one of my first tastings at TWE Vinopolis (in the dark days before I came to work here) being a trip through their whiskies led by distillery manager Malcolm Waring, and more recently having a great time wandering around Wick as part of my tour of the Inver House distilleries. 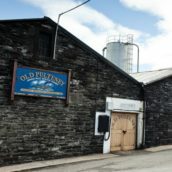 However, they’re not a distillery who has been much in the limelight, something which is now bound to change -a change that I’m rather pleased about, as they certainly deserve it. Well done folks. Anyways, within minutes of the announcement hitting the internet we (and pretty much everyone else) had sold out of the 21 year old and we are now waiting for more to come in – we’ll post an update here on the blog once we have more stock available. Nose: Apple, butterscotch, Malted Milk biscuits, bananas and a little bit of lime. When I tried it with Joel of Caskstrength.net he both jumped around and talked about Shreddies. Slightly scarily. Taste: A sweet start, moving on to marzipan and then sour fruit, green apple and cinnamon. There’s also vanilla, dry wood and some of the bananas from the nose, as well as some floury, pastry notes and some butter. Finish: An interesting one with this, with coconut (shell and flesh), a whiff of menthol and a bit of gooseberry just before it fades. Nose: Chocolate cake, developing strong mocha notes; dark gingerbread – all pointing to a heavier wood influence than the 12yo, and particularly the 17yo. Palate: Medium-full. Milk chocolate; quite woody, initially, possibly even a little cardboardy. Pancakes and flapjacks, plus the uniquitous Pulteney saltiness. Becomes citrussy with water, but I felt it didn’t swim too well. Better at full strength. Finish: Decent length, with the wood, mocha and brine still evident. Comment: Very enjoyable, but the 17yo remains my favourite of the range. Anyways, we should have copies of Jim’s book appearing on the website shortly [Update: it’s in], but in the meantime there’s a complete list of the award winners behind the fold and a page of all the ones we have in stock on the website. Quite a list, with some great whiskies on there. No doubt some of you will be finding Jim’s book in your stockings this Christmas (in which case apologies for leaking the list like this. Forget everything you’ve just read). 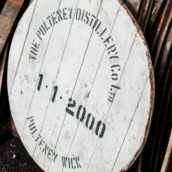 Our congratulations to Malcolm Waring and everyone else at Pulteney distillery. We look forward to this underrated malt receiving more of the recognition it deserves. Interesting notes. OP is an old favourite of mine and in the last 3-4 years I have consumed at least 4 bottles of the 17 yo, 2 of the 21 and a few of the 12. I do think the 21 is a great dram but the 17 for me is a clear favourite and given the choice of one dram from one of the 2 I’d always go for the younger one. It’s a fine whisky, but 97.5 out 100? He is running out of points somewhere next year or so. Who get’s the perfect 100? Having tasted both 17 & 21 I can say that the 17 was my winner too. I agree that the 17yo is quite a bit superior to the 21yo.